My English Book and Me 3 Classbook and Homebook are ABC phonics texts. 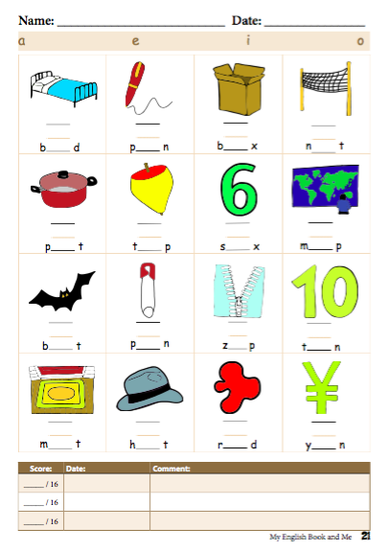 Children will learn many new words as they learn their phonics. There is constant review and re-enforcement with mini - tests. Students also learn conversational questions and answers. If phonics is SO important, why don’t kindergarten kids begin with My English Book and Me 3 also? Simply because children do not have the pencil skills until the age of 5 or 6 to WRITE the phonics. BUT in MEB1 and 2, they can learn lots of new vocabulary, question and answers and recognize their phonics BEFORE writing. They become confident, vocal students and are well prepared to begin writing in MEB3. If a mini - test was assigned for homework, they will do the mini - test in class. (for homework, the student practiced in a notebook, not writing in the text). 3. Children work at THEIR pace. If they have many mistakes, they will do the mini - tests 2 or 3 times. If they have few or no mistakes, only once. 5. At the end of writing time, the teacher will assign 2 pages in the home book for homework and ready the pages for the following week (folding down pages with many mistakes to be re-done the following week (and erasing the mistakes if time also).